Council bosses are highlighting an improvement in the percentage of young people feeling safe in Rotherham town centre following the publication of the latest schools survey, but fewer pupils say they visit regularly. The Borough Wide Lifestyle Survey has been carried out since 2006 and this year saw 2,806 pupils take part from 12 schools. It is considered a valuable tool by the Council, helping to provide an idea of what young people understand and can enable the council to tailor services towards young people. Issues covered include food and drink, education, sexual health, bullying and safety. The results showed that young people visiting Rotherham town centre has reduced again. Respondents who said they visited Rotherham town centre regularly (at least once a week), was up to 40% in 2014. For 2016 this is slightly down to 26% (732 of pupils) from 27% in 2015. 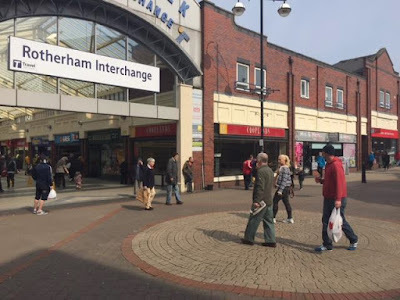 10.6% (299) young people said they had never visited Rotherham town centre. The survey shows that the main reason that young people go into the town centre is for shopping (50%) with other reasons to attend a football match at New York Stadium and to meet friends. On the issue of safety in Rotherham town centre, 2015 results showed that just 18% of pupils said they felt safe in town centre and 82% said they did not feel safe. The questions for 2016 survey were changed slightly to ascertain how safe young people are feeling; with the options of always feeling safe, sometimes feeling safe or never feeling safe replacing yes I feel safe or no I don't feel safe. Overall the 2016 results show that 24.6% of pupils said they always feel safe, 45.4% said they sometimes feel safe and 19.3% said they never feel safe. When asked about Rotherham bus station, 2015 results showed that 15% of pupils said they felt in this location and 85% said they did not feel safe. Overall the 2016 results show that 23.6% of pupils said they always feel safe, 38.3% said they sometimes feel safe and 16.1% said they never feel safe. 22% of pupils overall said they have not used the interchange. Following reports of concerns of safety at bus stations the South Yorkshire Passenger Transport Executive (SYPTE) updated information on their websites and put in place reporting mechanisms. The draft capital strategy from Rotherham Council included an ambition to invest in "Improvements to the Transport Interchange, to address current condition and public safety issues. The aim is to create a new, brighter, safer environment and address some of the issues around CSE in and around the existing Interchange." A refurbishment of the car park and interchange, estimated to cost some £12m, could begin this Summer. Pupils were also asked to rank what they felt the biggest risk was to their safety in the town centre. The top risk reason was the fear of large groups/gangs. A perceived lack of visible security (for example police, wardens) has improved as this is now rated as the 9th in the risk list, replaced in 3rd place by protests and marches. Pupils ranked Better CCTV and Fewer Large Groups/Gangs as ways to improve the town centre to mitigate the risk of children and young people feeling unsafe. The survey also showed that 31.7% of pupils said that they would not recommend Rotherham as a place to live, a reduction from 34% in 2015. 37.5% also said that they would not like to be living in Rotherham in ten years' time. This is a reduction from 48% who gave this response in 2015. A new town centre masterplan is in development and will include potential cinema and leisure developments alongside a new £12m higher education campus that could eventual see 1,000 students based in the town centre. Next month sees the launch of a new placemaking strategy for the borough with distinctive themes, ideas and imagery that help to tell the Rotherham story set to be used as a way of promoting the borough to potential investors, visitors and workers.